Coffee, chocolates and alcohol..how I cherish them. But a dog probably doesn’t feel the same — all these three items are poisonous to them! And this difference is the basis for my next topic: Species Sensitivity Distribution (SSD). All species have unique sensitivities to chemicals. SSD tries to ‘map’ these sensitivities. In toxicological terms, SSD is a mathematical model that describes the variation in toxicity (or chemical sensitivity) between species. For SSD to work well, it is important to select a set of species that are similar to one another or share similar habitats. This is because species that are alike or live together are more likely to respond similarly. Then, for each species, a selected ‘endpoint’ for a chemical (example: the concentration of a chemical that kills 50% of a species’ population) is selected and plotted on a graph. Based on how well a line fits through the endpoints, the distribution of species can be described graphically (see image for reference). SSD can be used to set a safe limit for a chemical in the environment. The concentration that causes no harm to at least 95% of species is often selected as the maximum safe limit. 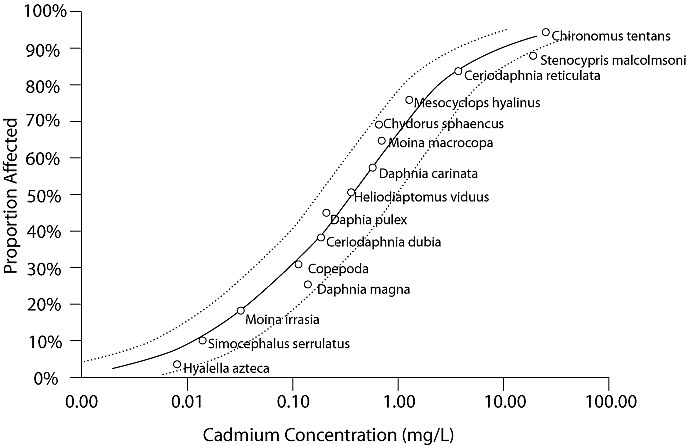 For example, in the above graph, the safe limit for cadmium could be set around 0.01 mg/L. Conversely, it can also be used to estimate the proportion of affected species at a given concentration. And, as there exists many species that cannot be tested due to experimental, ethical or financial restrictions, sensitivity data from other species can be extrapolated to non-testable species through SSD graphs. SSD data come from single species toxicity tests. This means ecosystem-level effects like interactions between species and habitat cannot be captured. While chronic (long-term studies which look for sublethal effects) data are preferred, acute (short-term studies which look for lethal effects) data are frequently used. This is because mortality is easier to extrapolate to other species. In the environment, chemicals are present as mixtures (i.e., two or more chemicals are present together). SSD data are usually from lab studies that look at the effect of each chemical separately. SSD doesn’t take into account the availability of chemical in the environment (is the chemical free to bind and cause an effect?) and the likelihood of chemical exposure to organisms. SSD doesn’t place greater importance on survival of species that are critical for the ecosystem, and on which other species depend on. SSD is a powerful tool for setting safety limits for chemicals and for estimating a chemical’s effect on non-testable species. The sensitivity of endangered and threatened species is often estimated using this method. However, as extrapolation of data is inherently uncertain, SSD is not a foolproof method to estimate ‘safe’ concentrations of a chemical. Leo Posthuma, Glenn W. Suter II, Theo P. Traas. Species Sensitivity Distribution in Ecotoxicology. CRC Press Book (2001).